We at the Carrollwood Cultural Center rely on the support of the community to help sustain our programming which enables us to fulfill our mission. “We live in an age when the most valuable asset any economy can have is the ability to be creative—to spark and imagine new ideas, be they Broadway tunes, great books, iPads or new cancer drugs.” – Thomas Friedman, New York Times. Remember the old refrain, “Lights! Camera! Action!”? All shows start with the lights turning on. (If you want to wax philosophical, so does everything else.) The Center’s “Turn on the Lights” campaign is raising funds to upgrade lighting in the main theatre. Our building was not originally designed as a performing arts venue, and its lighting technology is limited. We want to be able to support and provide multimedia, film, theatre, musical performances and other events for the community. Individual donations can be given as an unrestricted gift to be used where it is most needed. Those who find it difficult to give one lump sum will be happy to know that pledges for financial support can be set up as a recurring gift. Celebrate the life of friends or loved ones by making a donation in their memory. Acknowledgement cards will be sent to the next of kin making them aware of your gesture (gift amount will not be listed). Memorial Gift Form available here: CCC Memorial Gift Form or you can enter an honoree on the online giving form here. The Tom Jones Tuition Assistance Fund was established to assure that the arts remain accessible to all individuals within the community regardless of their ability to pay. Adults and children from low income families are able to attend classes or Summer Camps thanks, in part, to the generous donations made to this fund. Established by Mr. & Mrs. Bob Kerns in 2011, the Lily Bug Music Fund supports the Carrollwood Cultural Center Community Chorus. The fund helps with expenses such as: sheet music, guest artists and accompanist specifically for the chorus. The Chorus currently has a need for risers! 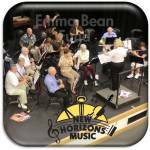 Established by Mr. & Mrs. Bob Kerns in 2013, the Emma Bean Fund supports the New Horizons Band at the Carrollwood Cultural Center. The Center’s gallery is a living, growing, and constantly changing, display of creative talent of visual artists – both local and international. Donations to the Gallery help with hanging system maintenance, art reception costs, awards, and future lighting upgrades. Donations to this fund help support the Carrollwood Winds Community Band by offsetting performance costs, music fees, and instrument purchases and maintenance. Donations to the Piano Fund are tax deductible and help pay for the 13 various pianos throughout the Carrollwood Cultural Center and the maintenance of these fine instruments. Click here to make a donation. You will be able to choose a specific fund you would like to support or you may choose “General Operating Fund”. All donations more than $10 will receive a letter of appreciation. All gifts are tax-deductible. For more information, contact Todd Dunkle at todd@carrollwoodcenter.org. Friends of CarrollwoodCultural Center is a 501(C)(3) not-for-profit organization and all gifts to FCCC are tax deductible to the full extent provided by law. A COPY OF THE OFFICIAL REGISTRATION AND FINANCIAL INFORMATION MAY BE OBTAINED FROM THE DIVISION OF CONSUMER SERVICES BY CALLING TOLL-FREE 1-800-435-7352 WITHIN THE STATE. REGISTRATION DOES NOT IMPLY ENDORSEMENT, APPROVAL, OR RECOMMENDATION BY THE STATE. REGISTRATION NUMBER CH16973.